Fix lexer bug: underscore ('_') is now accepted as a valid character in identifiers and pointers. Fix folding bugs: fold headers are now consistently placed throughout a GEDCOM file. Fix lexer bug: multi-byte UTF-8 code points and other MBCS code points are no longer flagged as invalid in values. Questions & comments are welcome. Fix a variety of bugs related to determining the LangID code displayed in the plugin’s About dialog (the LangID is needed by Notepad++'s Function List feature). Fix a bug in the Function List parser for GEDCOM names, that prevented the names to be displayed for GEDCOM files exported from Ancestry.com family trees. Convert the project to use Visual Studio 2015 for development. 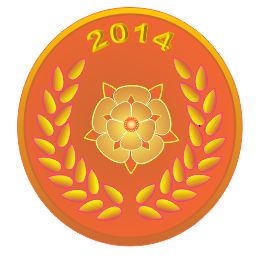 GeneAwards 2014 - Honourable Mention! Tamura Jones has announced his 2014 GeneAwards winners at Modern Software Experience. I was quite surprised to see that in the category of "Best New Genealogy Add-On of 2014," my GEDCOM Plugin for Notepad++ received a second-place, honourable mention. Earlier this week, the GEDCOM plugin made it to the official list of Notepad++ plugins. Registering a plugin and getting it accepted is fairly easy. But there is a big benefit to the user: your desired plugin is just a click away. No more downloads, unpacking zips, and copying files to multiple directory locations. You can thank the Plugin Manager (also a plugin!) developed by Dave Brotherstone for this effective system of plugin management. When you register a plugin, you supply the information the Plugin Manager needs to find your zip (a download URL), identify its version, and tell it what needs to be extracted and where it should go. With just that information the Plugin Manager can perform installs and updates of registered plugins. It does this magic and also stops and restarts Notepad++ to make the changes take effect. And if the plugin doesn't do what you want, it's just as easy to remove it. You will notice that GEDCOM Lexer is still at version 0.1. Generally, Plugin Manager will lag behind the latest and greatest, for that you may still need to do a manual update. GEDCOM Plugin v0.2 can now use the Function List to navigate to individual names. This allows you to double-click a name in a list to go directly to that INDI record in the GEDCOM file. Notepad++ has a Function List plugin that comes already installed (more...). At one time this was an independent plugin developed by Jens Lorenz, but has been integrated into the main program since version 6.4. The Function List panel (shown above) can be displayed by clicking the "Function List" command under View on the main menu. Any file type can define a rule for filling the Function List panel. Each node in the list serves as a hyperlink to a location in the file. Double-clicking on a node will take you straight to that file location. The larger image below better illustrates the relation between a viewed file and the Function List panel. Setting up the Function List for the GEDCOM file type requires adding two entries to Notepad++'s functionList.xml configuration file. This file is user specific, so it is located in the directory: %APPDATA%\Notepad++. Note that if an INDI record contains more than one PERSONAL_NAME_STRUCTURE, only the first one encountered will be displayed. To learn more about the Function List see the Notepad++ Function List page. To download this example functionList.xml file, grab it from the SampleFiles area on SourceForge.